Parallels has launched a remote desktop solution that turns traditional Windows and OS X applications into iPad apps to make them easier to use on Apple's tablet. 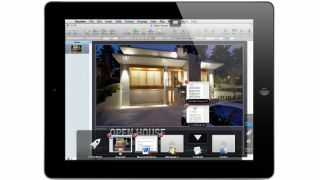 Named Parallels Access for iPad, it lets you run desktop apps in full-screen mode on the iPad over an internet connection. The software supports native iPad gestures like select and drag, holding down to copy and paste text or images, tapping and holding to magnify text, and allowing iPad scrolling with two fingers, in addition to switching between open apps with a tap. The company is hoping that the solution will tempt people away from traditional remote desktop offerings that usually mirror the desktop experience in full on mobile devices, which can result in cramped text due to devices' differing resolutions. Parallels Access for iPads is available for iPads with support for Macs, and Windows Support is available as a free beta, while support for other devices is apparently in the works. Each Mac or PC needs its own subscription though, so you'll have to cough up US$79.99 (around £52, pr AU$90) for a one-year subscription for each computer to be accessed. Clearly, Access could make life easier for companies with iPad-equipped employees that need access to desktop programs on the go. We could see it opening a few doors for consumers too. Spotify would be a perfect example: instead of paying £9.99 for the monthly mobile subscription, you could fire up Access and load the desktop version of the app to get a similar experience while only having to pay £4.99 a month for the standard, non-mobile subscription. Of course, factors like bandwidth and internet connection quality will come into play, and you'd still have to pay for the Access subscription itself - but it could prove a nifty solution for those desktop apps that are yet to make the leap to tablet.